Thinking about a new demo? Just need an updated voice over demo? Most voice talent create a single demo, and never freshen it with new material, waiting 2 to 3 years to create NEW professional demos. This is the death of many talent today. Ask yourself this demo related question; “How do my demos sound to purely objective ears?”. Anthony can evaluate your voice as a beginner, OR your current voice over demos as a professional voice talent. His voice over consulting service, and technical help can offer honest, constructive, non-bias feedback to assure your competing with quality voice over demos. Hard love can be helpful to an artist, and Anthony will offer positive suggestions to help improve the overall appeal of your demos. Many students do not know, that Anthony has created, managed, or developed several social media websites, business sites, internet broadcast stations and other web based domains. The VO101 site along with many of his own professional sites like Cartoon Actors, United Voice Talent, VoiceTOONS, and his own voice over website are managed and co-designed by Anthony. You do NOT need to spend thousands of bucks to have a great, effective voice over website. Anthony can review your current website and/or P2P listings, Facebook, etc and offer feedback. He can share technical voice over help such as SEO tips and other comments to rank, or index your voice over website, and explain how take advantage of proper placement, and playback of demos. Have a review done today below. When looking for a new voice over microphone, should you go for a USB, or XLR style voice over microphone? Is a large diaphragm microphone better? Which studio sound foam works best? 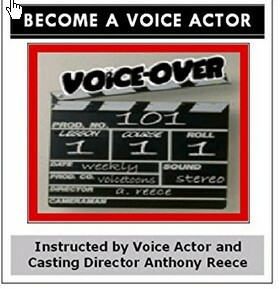 If you’re setting up a home voice over studio, need voice over business advice, or just need to pick the brain of a veteran in the voice over industry, Anthony is available for technical voice over support, voice over working advice, voice over business tips, and other voice over related issues faced by working voice talent, or clients working with voice artists..
Whatever your technical voice over support issue, or voice over business matter, Anthony can offer wisdom from his 25 years in the voice over and voice casting business. Request support using PayPal below. By the way, this and more are part of his 30-day personal Power Plan. Along with the most affordable private voice over lessons, voice over mentoring and voice over coaching in the industry, you can also request hourly studio technical, or voice over business support from Anthony Reece. Make your payment by e-check, credit, or debt card using PayPal below. Note due to limited times available, no refunds are offered once you book voice over technical support time.